Needless to say, I had to eat at Zark's! Zark's is located right across De La Salle University. Too bad it was not around back when I was still a student there. My then-active metabolism would have enabled me to pig out everyday while maintaining my skinny frame. 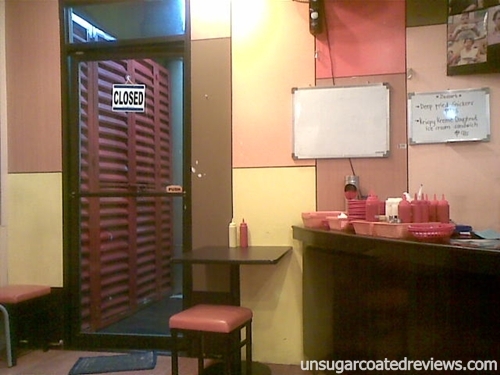 This review is for our two visits to Zark's. Sorry for the pale, oversaturated pictures. Those ones were taken using my old cellphone. This is not a place for vegans and other health/figure-conscious folks. Zark's Burgers serves greasy slabs of meat and is not apologetic about it. 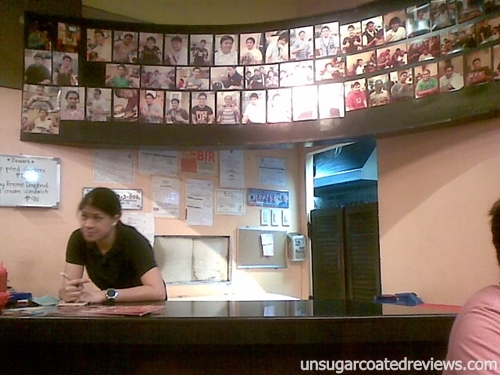 This is the place to go to when you want to escape your calorie-counting friends who only eat the "right" kind of fats. The burgers are big and there are tons of choices available (29 kinds of burger last time I checked). I couldn't even graduate to the "Major League" burgers because even the "Minor League" burgers are big and filling. Yes they are greasy, but not the gross kind of greasy. The fries are thick, with the skin on - exactly how I wanted my fries. The veggies are fresh and crisp. 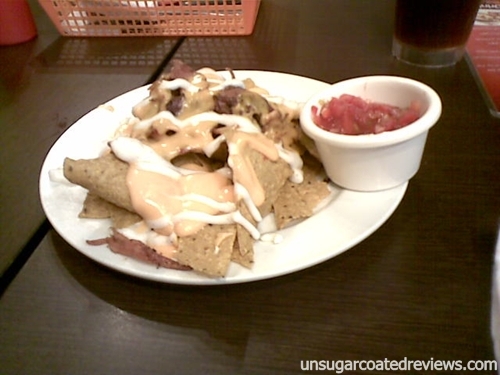 The nachos have generous cheese sauce and bacon bits and the salsa is good. The food is very affordable. A good thing, since most of the customers are students from nearby schools. The majority of the burgers are priced below P200, even the major league ones, and the smallest burger is already a quarterpounder. We just had to add P20 for hand-cut potato chips or fries and iced tea. We sort of regretted buying a separate order of French fries, since the ones that came with the burgers were already more than enough. I think you get a better deal here than in more popular fastfood joints. More bang for the buck indeed. Zark's also got this Jawbreaker challenge. Their Jawbreaker is a triple cheeseburger with Spam, egg, and cheese sauce. If you finish it within 5mins, you don't have to pay! So if you're a fast eater with a huge appetite, you get to leave this place feeling really full, for free. 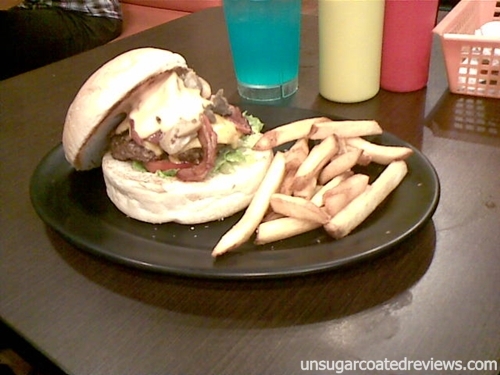 Zark's Burgers is a smallish, modest diner. It has an easy, relaxed ambiance though. I was urged to just grab my burger with my bare hands, without worrying that other people might find that unladylike. During our two visits, there was also a sort of positive communal feeling. Customers in different tables didn't know one another but we could openly stare and smile at Jawbreaker challengers, commenting about their progress while silently cheering them on, without the challengers feeling annoyed or self-conscious. In other places, that would have probably been met with dagger looks. Life without bacon is a life not worth living. There is also a Hall of Fame, featuring customers who were able to finish a Tombstone within 10 minutes. Bf and I wondered why there was not a single girl there. Were the ladies really not up to the challenge, or were there successful ones but did not want to ruin their feminine, colegiala image? It would be awesome to see a girl in the Hall of Fame! Clean. I was worried that smoke would fill the dining area since the resto was just small, but nope, no smoke at all. We got terrific service on both our visits, even though we used a voucher on the second one. The staff were polite, accommodating, and cheerful. In fact, they were a lot warmer and friendlier than staff in more pricey restaurants we'd tried. I have a coupon for Zark's! :D Hopefully I get to use it already after the Holy Week. Would love to try their burgers, I don't think I'll be ordering the Tombstone though. Wow!!! That huge burger is already enough for my lunch and dinner. American All Star looks wow. Bat mukhang masarap masyado? Ultimate burger looks O___O too. uy mura na yung price nila for that kind of serving ah!!! yup. 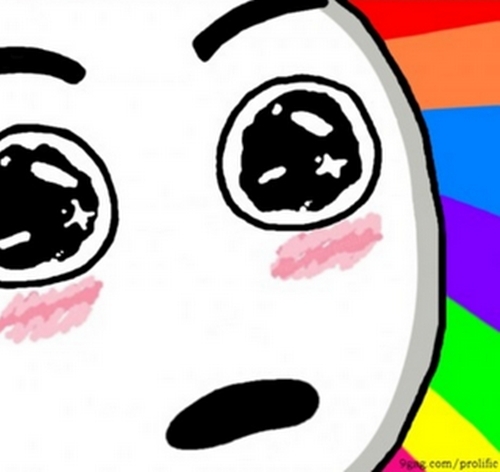 sa ibang resto P300+ na siguro yung smaller burgers ng Zark's, wala pang drinks. Thumbs up with Zark'sburger .I really like bacon in my burger.bacon added flavor and taste to the burger. Wow, this is the perfect place when I am hungry, I love beef! i'm not a vegan so perfect to sa kin'hehe! medjo malayo yun Taft dito sa min'. I hope there;s zark too here in south . .like your post today hehe! where's your gplus btw can't see hehe! natry ko na ark's way back nung student pa ako pero ndi ko pa natry yung tombstone eh. Ay itry na yan ... gusto ko yung tombstone! awww it would have been perfect for me if the burger just have the bacon and mushroom minus the beef patties! i'm allergic to beef big time but love bacon and mushroom! I'm not sure that can still be called a burger if there's no patty (more like bacon and mushroom sandwich hehe) but I saw a post in Zark's FB page saying that they accommodate custom burgers as long as they have the ingredients, so they can probably make you one without the patty. 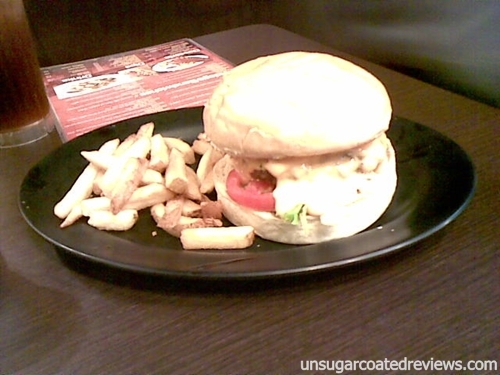 My last visit at Zark's was great, tried their tombstone and really liked it. 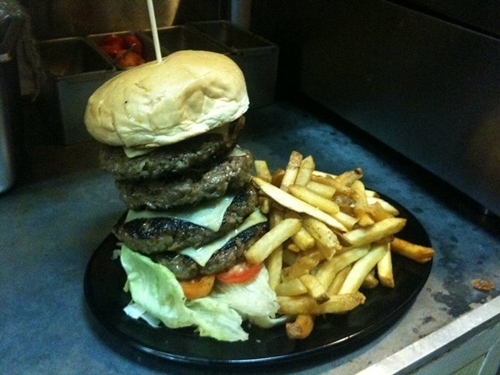 did you take the zark's challenge? Whoa! The Jawbreaker is really huge! I'd like to try the grilled burger at Zarks!